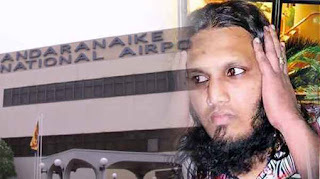 hree more persons, who were arrested with “Makandure Madush” and deported from Dubai, have been taken into the custody of Criminal Investigation Department upon their arrival at the Bandaranaike International Airport today (28), the Police Spokesperson said. Notorious organized criminal leader Mohamed Najeem Imran alias “Kanjipani Imran”, who was arrested with the drug kingpin “Makandure Madush” in Dubai, has been deported to Sri Lanka, the Police Spokesperson said. Accordingly, he has arrived at the Bandaranaike International Airport (BIA) in Katunayake this morning (28). Upon his arrival at the BIA, the Criminal Investigation Department (CID) had taken “Kanjipani Imran” into custody for further questioning, the Police Spokesperson added. “Kanjipani Imran” had been planning to flee to the Maldives via Sri Lanka following his deportation from Dubai, according to sources. On February 5th, the Dubai Police had arrested “Makandure Madush” at a party which involved drugs. Several prominent underworld figures and Sri Lankan celebrities including singer Amal Perera and his son Nadeemal Perera were also taken into custody at this party thrown by Madush. Two arrestees, Nadeemal Perera and a prison officer named Lalith Kumara, arrived at the BIA last morning (27) after being deported from Dubai. The Criminal Investigation Department and the Police Narcotics Bureau had held the duo at the airport for interrogation. Nadeemal Perera, who is also a popular singer in the country, was released after recording a statement for over 7 hours and left the airport premises. However, the 52-year-old prison officer was handed over to the Colombo Crimes Division (CCD) for further interrogations and arrested after another seven-hour long interrogation.